The established players in the mid-price active monitor market just got some serious competition. Tightly controlled, well-rounded bass. Treble response is pleasingly unflashy. Monitor link option provides easy amplification of portable music players. 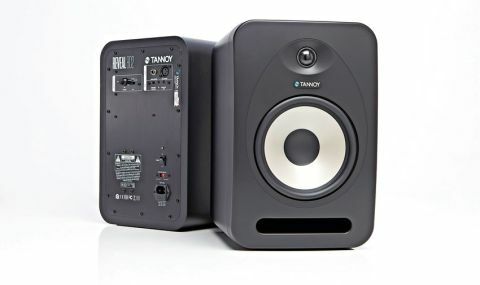 Tannoy's name is synonymous with speaker design but it is more readily associated with PA speakers and larger sonic installations than with active studio monitors. That may well be set to change now with the new Reveal range, which sports model numbers from the smallest/cheapest 402, through the mid-sized 502, to the flagship 802. As its name and number suggest, the latter is the largest speaker in the range, featuring an 8-inch bass driver and a 1-inch tweeter, with a rubberised padded base incorporated to provide acoustic isolation and a more balanced bass end. Around the back, you can connect balanced (3-pin) or unbalanced (1/4-inch) input sources, whilst Tannoy also supplies a mini-jack cable which can either be used as an input source in its own right or supply an auxiliary monitor link, allowing you to send an output from one Reveal to another - a useful way of connecting a portable music player or iPad via a single cable and distributing the output on to a second speaker. A blue LED indicates that the power is on and we're glad this is on the back panel as it's very bright! "Alongside the volume input dial, there is also a rocker switch to select a natural frequency response"
Alongside the volume input dial, there is also a rocker switch to select a natural frequency response, or additional offset options to increase or decrease treble balance. This can be useful, as it'll help tailor the speaker's overall sound to the natural frequency response of your working space. As ever, be careful that these options aren't simply engaged 'to taste'. If you're particularly partial to enhanced treble levels, don't simply activate this switch to satisfy those 'shiny needs', as it could end up leading to your mixes sounding too light at the top-end elsewhere. The final option supplied on the rear panel is a proximity switch, which lets you adjust bass response depending on the distance of your speakers to walls behind them. Adjustments made, you're good to go. The full frequency response of the monitors is an impressive 42Hz to 43kHz, with the crossover frequency between the Low/Mid and High Frequency drivers at a sensible 1.8kHz. In use, the standout quality of the 802s rushes to the fore with a punchy bass response with an extremely rounded tone. For the size and price, we were impressed by the consistency and weight of this bottom-end; these speakers really have been designed with low frequency clarity in mind. More surprising yet equally pleasing is that the top-end is more discreet than we were expecting. Rather than rushing out to meet and impress you in an artificial way, the 802's treble end is a more sophisticated performer, providing more than adequate level without over-brightening sounds. This makes prolonged mixing sessions on these speakers much more pleasurable, lessening the likelihood of ear fatigue. Stereo imaging is good too, with a wide listening sweet spot and a pleasing depth of field which will appeal to soundtrack writers and producers working on less beats-oriented music. However, if solid and tight bass response is a key ingredient of the music you make, the Reveals are particularly worthy of a few minutes of your ears' critical listening. For Hip-Hop and EDM producers, you won't fail to be impressed by the reach and clarity of the lowest frequencies of your mixes on these speakers, without things getting messy. With up to 100 Watts of power, it's especially pleasing to hear that they respond consistently between very quiet and loud monitoring levels too, so regardless of the volume at which you like to mix, you can be sure the nuances and subtleties you're putting into your mixes are being accurately replayed. Things just got a lot hotter in the mid-price active monitor department.